Eight very interesting lectures, four outstanding wine tastings - one in the morning and one in the afternoon of each day - and a walking wine dinner provided for two fascinating and highly entertaining days around Riesling at the 1st International Riesling Symposium that took place a couple of months ago at Schloss Rheinhartshausen in the Rheingau in Germany. The Symposium was attended by about 150 people, including such luminaries as Jancis Robinson from the UK, Willi Bruendlmayer from Austria, Helmut Doennhoff from the Nahe, Ernst Loosen from the Mosel and Colette Faller from Domaine Weinbach in Alsace, and many others. I have provided my impressions about the Symposium here. This posting focuses on one (of the four) major tastings, in which we tasted 21 First Class dry Rieslings from Austria, Germany, France and the New World. I have reported about the tasting of aged Rieslings here and about the tasting of lusciously sweet Rieslings here. We tasted dry Rieslings. Many wine drinkers, in particular outside of Europe, when they see a Riesling in the shelves, have the association of a sweet-style wine. This is however misguided. Rieslings as a rule are dry wines. Of course, there are the famous sugar sweet Beerenauslese, Trockenbeerenauslese, Eiswein and Schilfwein wines from Austria and Germany, the Sélection de Grains Nobles from France, the icewines from Canada and other Rieslings, made from botrytized, dried or frozen grapes. The grapes that go into these wines have such a high sugar content that there is nothing you can do to make dry wines out of these grapes. They inevitably produce nobly sweet wines. But apart from these exceptions, which account for only a tiny share of total production, Riesling grapes in Germany, Austria, Alsace, the US and Australia have normal sugar content at the time of fermentation and tend to produce dry wines, when fully fermented. However, modern cellar methods allow winemakers in Germany to produce wines with a bit of residual sugar with these grapes. There are principally two methods applied in Germany – but neither in Austria nor Alsace - for making these sweet-style Rieslings. First, you do not let the fermentation run its course and stop it; as a result, you get a deliciously sweet and low alcohol wine. Second, you let the wine fully ferment to a normal alcohol level and then add Suessreserve (sterilized juice) to achieve the desired degree of sweetness. These sweet-style wines have lost popularity in Germany, although there appears to be a comeback, but in any case remain very popular outside of Germany, for example in the US. Josef Schuller released information only in thin slices. The first thing we learnt was that we had tasted: 3 New World wines, 3 wines from Alsace, 6 Austrian Austrian wines, 2 wines from the Nahe and Pfalz regions in Germany and 7 Rieslings from the Rheingau. Josef Schuller wanted us first to identify the 3 New World wines. The group quickly came forward with wines (20) and (3), but it took several attempts to identify wine (4) as the third New World wine. (20) Forrest Wines is a small producer of premium white wines in Marlborough in New Zealand. Leaving behind careers in molecular biology and medicine, John and Brigid Forest returned to Marlborough in 1988 to establish their first vineyard in Wairau River Valley. Vintage 1990 saw the first Forrest wine. (3) The regular dry Riesling of Chateau Ste Michelle in Washington State; Ernst Loosen produces his Eroica wines in a joint venture with Chateau Ste Michelle. (4) Frankland Estate is a family-owned and operated winery in the Frankland River region of Western Australia. Frankland Estate combine organic viticultural practises with a minimal intervention approach to the fermentation and maturation of the wines in the cellar. Wine (15) from Domaine Weinbach was quickly identified. David Schildknecht then suggested wine (16) and was right. “The acidity is higher” David said. Somebody else suggested wine (10) – a Rheingau Riesling from Weingut Wegeler – and was wrong. Finally, somebody came up with wine (21) – a Domaine Trimbach Clos Sainte Hune, arguable one of the best Rieslings of the world. Gunter Kuenstler from Weingut Kuenstler was the first to come forward with wine (13) and he was right. “A distinctive nose, a typical Wachau wine” Gunter said. Somebody else then suggested wine (5) and was right. With some coaching by Josef Schuller, Willi Klinger identified wines (8) and (9): “More acidity, more stone fruit than the Alsatian wines” Willi said. The two other Austrian wines – (7) and (17) – were not identified by the group, despite further help by Josef Schuller. There was a long period of silence before David Schildknecht dared to suggest that wine (12) was from the Nahe. This was close, but wrong. Christian Witte then suggested that wine (6) was a Nahe wine: “More fruit driven” Christian Witte said and he was right. The other German non-Rheingau wine was not identified: wine (14). That left the remaining wines as the 7 wines from the Rheingau: (1), (2),(10),(11),(12),(18) and (19). We did not discuss the Rheingau wines. But the question came up, why Australia, the second largest Riesling producer in the World, was so underrepresented. David Schildknecht asked: “Where were the Mosel wines?” The Pfalz was also underrepresented, somebody else felt. Picture: Christian G.E.Schiller with Pio Boffa, owner of the famous Pio Cesare Estate in the Piedmont region, in Washington DC. 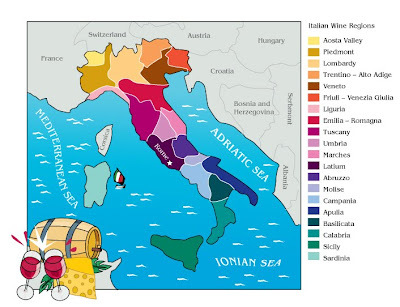 One of the best, if not the best, Italian wine guide is Gambero Rosso’s Vini d’Italia. 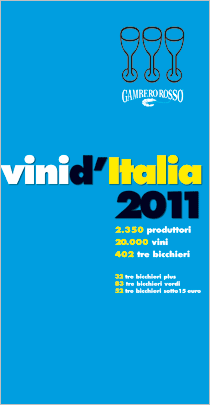 The 2011 issue includes 2.350 winemakers with over 20.000 wines, divided by region. The best winemakers are awarded glasses, from 1 to 3 glass(es). Individual wines are also awarded glasses, from 1 to 3 glass(es). This year, 402 wines got the top award of 3 wine glasses. This compares with 392 wines last year and 339 wines in the year before. The Gambero Rosso 2011 was issued in October 2010. The German and English versions are scheduled to be released in February 2011. 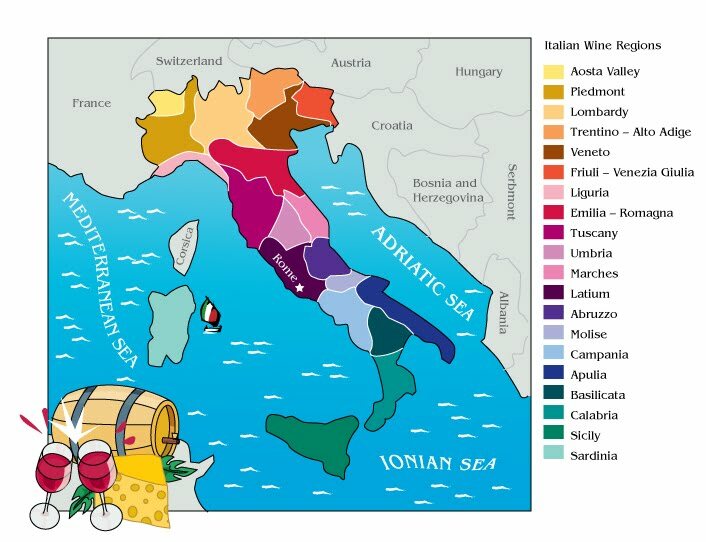 The Piedmont area of northwestern Italy is further divided into the two popular regions of Barbaresco and Barolo. The predominant grape there is the Nebbiolo. Northeastern Italy has the Veneto area. Soave and Valpolicella are two important regions that produce many local varieties. Pictures: Christian G.E.Schiller with Fritz Wieninger (above)and the WienWein Group (below) at the Heurigen Mayer am Pfarrplatz in Vienna. From left to right: Georg Koenigsbauer (Cellar Master Weingut Coblenzl), Gerhard J. Lobner (General manager Weingut Mayer am Pfarrplatz), Alexander Skoff (Cellar Master Weingut Zahel), Fritz Wieninger (Owner and Cellar Master Weingut Wieninger), Wolfgang Krinninger (Sales Manager Weingut Zahel), Rainer Christ (Owner and Cellar Master Weingut Christ). The participants of the European Wine Bloggers Conference 2010 (EWBC 2010) in Vienna had a very enjoyable evening at the Heurigen Mayer am Pfarrplatz in Heiligenstadt, Vienna. The WienWein group - an association of 6 innovative Viennese winemakers, whose objective is to promote the Viennese wines and in particular Viennese Gemischter Satz wines – had invited. That any wine comes from Vienna seems strange on the face of it. Great urban centers are not known for their vineyards, beyond a novelty vineyard here and there. But the capital of Austria is different. Around 500 vintners grow vine on around 700 hectares, all within the city limits. Indeed, Vienna has its own appellation and is one of Austria’s 4 major wine regions, with Niederoesterreich, Burgenland and Steiermark, though by far the smallest. Viennese viticulture stretches back centuries to Celtic and Roman settlements. White wine accounts for 80 percent of the production, mainly Grüner Veltliner, but also Riesling and Pinot Blanc. As for red wine, Zweigelt is the leading grape variety, followed by Pinot Noir, Cabernet Sauvignon and St. Laurent. Most of the Viennese wine is consumed in Vienna’s wine taverns - the about 100 Wiener Heurigen. The word “Heurige” means “the wine of the current year” – and this is what you drink there: the Heurigen owner’s wine of the last vintage, often coming in a jar. The Heurigen have been around for many centuries. They got a boost in 1784, when Emperor Joseph II formalized by decree the right of every winegrower to sell and serve home-made food and wine throughout the year at his premise. The best-known districts with large numbers of Heurige in Vienna are Grinzing, Heiligenstadt, Jedlersdorf, Mauer and Nussdorf. Although the Viennes Heurigen are the most famous in the world, you find them in all Austrian (and German) wine regions. The most special and also most popular wine in the Heurigen is the Gemischter Satz wine. Gemischter Satz wine is made from a blend of grapes that are grown together in the field and then picked and fermented at the same time. Not too long ago, this age-old Austrian tradition was about to die, threatened by the mania for single varietal bottling. But luckily, the tradition was maintained and the grapes remained planted in mixed vineyards of Gruener Veltliner, Riesling, Muscat, Ottonel, and other grapes. Field blends are different from more typical blended wines – cuvees - like Bordeaux, where the various grapes are grown separately and vinified separately. Many famous wines are blended wines. Red Bordeaux is generally made from a blend of grapes. Another blend is Edelzwicker, which I discussed in my “in the glass" column on November 5, 2009. See here. In the past, blending was the norm in Alsace, and these blends were called Zwicker. Edelzwicker (noble-blend) is a Zwicker made only from grapes considered to be noble. • The classic Viennese Gemischter Satz is from one or more vineyards in the Vienna wine-growing area, and is made of at least three varieties growing together in those vineyards. The wine is fermented in steel tanks in order to maintain the vividness of the fruit, and does not contain more than 12.5% alcohol. The WienWein logo must appear on the bottle capsule. Taste definition: fresh; typically “Viennese”; vivid; natural; spicy, and even rich in contrasts. • The site-specific Gemischter Satz originates from a single site, which must be named on the bottle label. The vines, which are planted together and feature a minimum of three grape varieties, are at least 20 years old. This wine, which can be matured in the traditional large wooden barrel (but not in barrique), must have an alcohol content of 12.5 % or more, and display the WienWein logo on the bottle capsule. Taste definition: multi-layered; expresses typicity of region and soils; complex; exciting; mineralic; elegant, terroir-rich; exudes an interplay of aromas, and is a versatile food partner. The WienWein group was founded in early 2006 by vintners from Vienna: Rainer Christ from Jedlersdorf, Michael Edlmoser from Mauer, Fritz Wieninger from Stammersdorf, and Richard Zahel from Mauer. With the presentation of the 2009 vintage, two new members have joined: Weingut Cobenzl (Grinzing) and Weingut Mayer am Pfarrplatz (Heiligenstadt). Overall, Vienna accounts for only 1 percent of Austria’s wine production. At the same time, demand for its wines in the Heurigen of Vienna has always been strong , fuelde by its own citizens and folks from around the country and the world. It is easy to see why there was more emphasis on mass wine than on quality wine, and to a certain extent still is. Against this background, the goal of Wienwein is to extract high-quality wines from Vienna’s terroir and establish new (and higher) quality standards for Viennese wine. Here are the 6 members. A Weingut with 6 hectares of vineyard land and around 400 years of family tradition. Owner Rainer Christ says that (1) winemaking firmly grounded in nature and (2) an innovative esprit in the vineyard and the wine cellar are the 2 cornerstones for wine making at Weingut Christ. Weingut Edlmoser is located in Vienna’s 23rd district, Liesing. The family has been making wine here since 1347. The estate has been run since 1998 by Michael Edlmoser, who studied also at Hall Crest Vineyards in Santa Cruz (California). The vineyard area totals 9 hectares. The internationally renowned vintner Fritz Wieninger is one of the pioneers of the Vienna wine boom. Until Fritz took over the approximately 100-year-old winery from his parents in Stammersdorf in 1980, it had been run purely as a Heurigen, producing mass wines for the wine tavern. Right from the start he shifted to quality and premium wines, experimented with new varieties and new approaches in the cellar such as temperature-controlled fermentation and barrique-aging. For two decades, he was alone in extracting high quality wines from Vienna’s soils. Today, few would dispute that Fritz Wieninger has been the seminal figure in Vienna’s transformation and his wines continue to be benchmarks. He has 40 hectares of vineyard land. Weingut Zahel has 20 hectares of vineyard land and buys fruit from another 5 hectares. In 2003 Richard Zahel was the first to market the "Wiener” Gemischter Satz. Today, Zahel’s Gemischter Satz is offered in 4 different styles. With 40% of total production, red wine is very important for Weingut Zahel. Indeed, Zahel’s flagship wine Antares was the first Viennese red wine to get more than 90 points in Falstaff, Austria’s leading wine guide. Weingut Cobenzl is located in the suburb of Grinzing in the north-west of Vienna. 70% of the vineyards is planted with the white varieties. Weingut Cobenzl is one of the two WienWein newcomers. It is named after Count Cobenzl, who owned the estate in the 1700. After various ownership changes, the City of Vienna bought Weingut Cobenzl in the early 1900s. With 48 hectares of vineyard land, Weingut Cobenzl is one of the largest wineries in Vienna. Weingut Mayer am Pfarrplatz has been making wine since 1683 in Nussdorf. The estate is rather large, with 55 hectares of vineyard land. The former owner, Ing. Franz Mayer, is considered as the leading doyen of the wine scene in Vienna. The winery was sold to advertising entrepreneur Hans Schmid in 2006. More than a third of the annual production is exported, around half the production, mainly the light, dry wines, is served on-premise. The WienWein group had invited us to one of its members’ premise, the romantic landmark-protected Mayer am Pfarrplatz. Ludwig van Beethoven (1770-1827) lived there in 1817 (therefore it is called Beethovenhaus) and the building has remained totally unchanged since then. The Mayer am Pfarrplatz is a full-fledged winery and a Heurigen at the same time, where the Mayer am Pfarrhaus wines are served. We had a great time with Gemischter Satz wines and hearty Viennese food. I enjoyed very much the possibility to talk with the WienWein winemakers, taste their wines and enjoy sausages, meat, salad - and of course Wiener Schnitzel. Later that evening, we changed the venue and moved one floor down in the party room of the winery where in a cheerful round not only glasses but also dance legs were swinging. What did we dance? Wiener Waltzer - Vienna Waltz, of course. 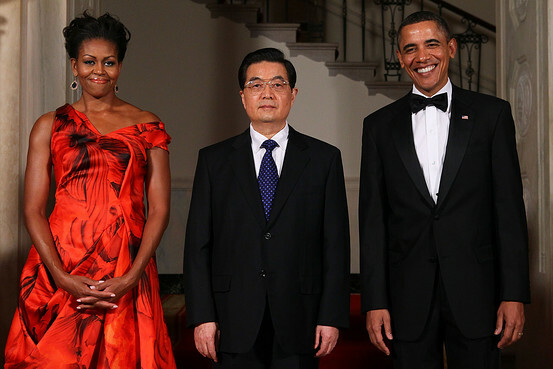 President Obama and First Lady Michelle honored Chinese President Hu Jintao with a State Dinner on Wednesday, Janaury 15 in the White House. The 225 guests were scattered in three rooms in the White House: Blue, Red, State, with the presidents eating in the State Dining room seated in a long table seating 20. Three wines were served, including a late harvest wine from Washington State, produced in a joint venture with German star wine maker Armin Diel. Unlike the other state dinners in the Obama White House, this time there was no guest chef, with White House executive chef Cristeta Comerford in charge. He created a "quintissentially American" state dinner menu for Chinese president Hu Jintao at the request of his delegation, the Blog Obama Foodorama reports. The entertainment was provided by Herbie Hancock, Chris Botti, Lang Lang, Dianne Reeves and Dee Dee Bridgewater. DuMOL is a biodynamically farmed Estate Vineyard located on 30 acres of east-facing slopes within the cool Green Valley sub-appellation of Sonoma’s historic Russian River Valley. Founded 1996, DuMOL produces a stellar lineup of highly-acclaimed Pinot Noir, Syrah, Chardonnay and Viognier. Partners Kerry Murphy, Andy Smith and Michael Verlander prefer to lead a low profile and let their wines speak for themselves. Their newly constructed, state-of-the-art wine making facility is powered by the sun. Quilceda Creek is a boutique winery dedicated exclusively to the production of world-class Washington State Cabernet Sauvignon. Founded in 1979 by Alex and Jeanette Golitzin, Quilceda Creek has had an unbroken string of highly-rated vintages that has led Robert Parker Jr. to name it Washington State's premier Cabernet Sauvignon producer. Although the winery facility is located west of the Cascade Range, the winery sources all of its grapes from six vineyards in eastern Washington. Long Shadows has become, in a short time, one of the premier wineries in Washington State . It is an unusual set up. Former Stimson-Lane CEO Allen Shoup works with renowned winemakers from around the world for this venture. Each winemaker creates a single wine using Washington fruit. Add resident winemaker Gilles Nicault to shepherd all of the wines along. The Poet’s Leap Riesling is made by Armin Diel, one of Germany’s most highly regarded Riesling producers. I met Armin recently in Berlin. His family has owned the celebrated estate of Schlossgut Diel in Burg Layen in the Nahe river valley since 1802. Schlossgut Diel is international renowned for its white wines, predominately Rieslings, across a wide range of styles. Armin Diel is also one of Germany’s leading wine writers. Armin and his wife Monika live in Burg Layen. Their daughter Caroline just completed her studies in enology in Geisenheim,Germany’s UC Davis equivalent, and is now co-managing the winery in the Nahe valley. Developing noble rot (botrytis) in Washington is not easy and Gilles Nicault and Armin Diel have only been able to make this wine in one previous vintage (2005). It’s fermented with Sauternes yeasts, and the fermentation is long and cool to maintain freshness and vibrancy. The acids in the 2008 white are perfect to balance all that delicious residual sugar. I have reported about the Poet's Leap Riesling here. Pictures: Christian G.E.Schiller with Manager and Owner Herintsoa Dany Rakotoson at Tsiky. Generally, one can eat exceptionally well in Antananarivo, at very, very reasonable prices. When it comes to wine, you definitely find a very good selection of mainly French and South African wines in virtually all restaurants. Regrettably, many of these restaurants do not serve Malagasy wine, although Madagascar produces its own wine. Of course, the Malagasy wines are no grand cru wines, but wines which I think can compete with the vin de maison you get in a typical Bistro in France. However, there are exceptions – restaurants in Antanananariov, where you can eat well and enjoy Malagasy wine. I have issued my list of favorites here. One of my favorite restaurants in Antananarivo is Tsiky, a place, where tourists typically do not go and expatriates with a good salary stay away from. But I went there on a regular basis when I used to live in Madagascar and often go there when I am back in Tana. Tsiky is one of my long-time Antananarivo favorites. I have published two lists of Christian G.E. Schiller’s restaurants in Antananarivo. First, a comprehensive list of Antananarivo’s restaurants was released on November 3, 2010 on Schiller Wine. I rated the Antananarivo restaurants from 1 to 5 stars. You find the list here. Second, I published a list of about a dozen restaurants in Antananarivo, where you can eat well and also drink Malagasy wine with your food. Generally, you have to go below the 4 and 5 stars level in order to be served Malagasy wine with your French and/or Malagasy food. You find the list here. Very charming Malagasy restaurant with an inviting ambiance. When I had lunch there last year, they had piano music. This is not a regular feature, I understand, but quite frequently during lunch. I rate Tsiky as a two-star restaurant. Tsiky is a restaurant that you do not find in any of the popular guides. But I believe it is one of the best places for French and Malagasy food at budget prices in an environment that has in my view a lot of class. In addition, I find it annoying that all the top restaurants in Antananarivo do not carry any Malagasy wines on their list. Tsiky, by contrast, does not serve any imported wine, but only Malagasy wine. The wine list is straightforward. No imported wine. Only local wine – Coteaux d’ Ambalavao and Cote de Fianar, red, white, gray and rose, in 0.75 and 0.375 bottles. The Coteaux d’Ambalavao is Ariary 11.000 in the 0.75 liter bottle and the Cote de Fianar Ariary 7.000. Both are produced by the Chinese Chan Fui et Fils. They produce three lines of wine: Coteaux d’Ambalavoa, Cote de Fianar and Beauvallon. 12 Rue Robin Ramelina - Atsimon'Analakely Antananarivo-Ville 101. Pictures: Christian G.E.Schiller with Silvia Prieler (above) and Peter Moser with the 3 Winners of the falstaff Prizes Andi Kollwentz, Clemens and Waltraud Reisner-Igler, Georg and Silvia Prieler (below). 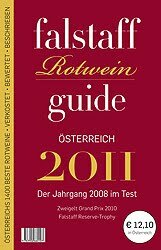 The Fallstaff RotweinGuide 2010/11, an wine guide for Austrian red wine only, was released in early December 2010 in Vienna, Austria. The Falstaff jury tasted about 1500 Austrian red wines of the vintages 2008 and 2007. The best wines went into the second round, where (1) the 3 overall winners (Falstaff winners) and (2) the 3 winners in each group of the major grape varieties were selected. In addition, (3) the 3 winners of the Donau Versicherung Reserve-Trophy were selected; these were aged wines from the 2007 vintage, released a year later than the other wines. At first thought one might think of Austria’s climate as being quite cool for red wine. In the Alps and the western and northern reaches of the country this tends to be true. The eastern plains that border Hungary and Slovenia, however, are a different story. Yes, Austria has an international reputation for its white wines, but the reds have been improving. Like in Germany, in Austria there has been a revolution going on in terms of red wines in recent years. In both countries, red wine now accounts for about 1/3 of the wine production. There are 3 key Austrian red grape varieties, although others are also grown, including international grapes. Zweigelt accounts for 9.0 % of Austria’s total production, Blaufraenkisch for 5.5 % and Blauer Portugieser 5.0 %. All other red grape varieties - including the international grapes Pinot Noir, Merlot, Cabernet Sauvignon and Syrah as well as St. Lauren - are below 2 percent each of Austria’s wine production. Zwiegelt: The most abundant red grape; makes good wines ranging from simple cherry fruit reds to more substantial reds destined for aging. Blaufränkisch: Common in Burgenland, this makes spicy, sturdy, berry fruited reds which can have some tannic structure. Probably Austria’s best red grape. St. Laurent: Came from France in the mid-19th century, and seems to have substantial Pinot Noir parentage. It makes soft, slight herby, expressive reds; it’s a bit like Pinot Noir. The 3 Fallstaff winners are those wines which scored the highest points among all rated wines. 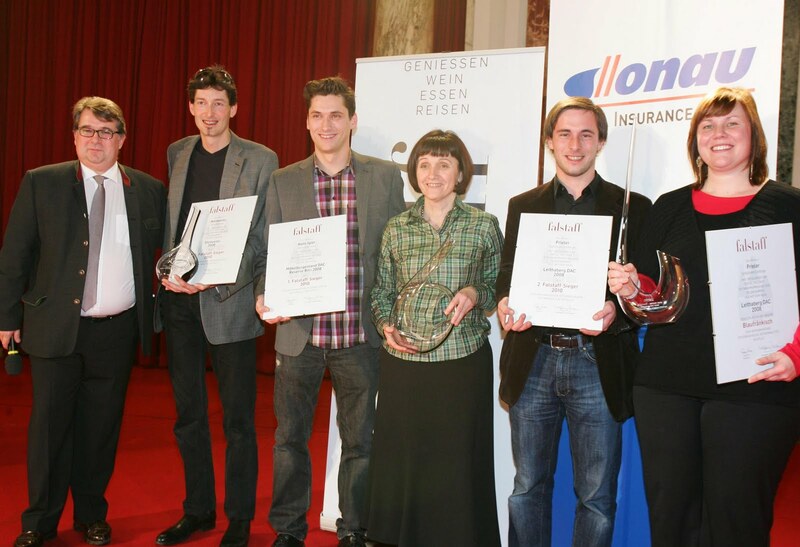 It should not come as a surprise that the first and the second place went to two Blaufraenkisch wines from Burgenland. The wine with the third highest score was the number one cuvee wine. 1. 2008 Blaufränkisch Mittelburgenland DAC Reserve Biiri, Weingut Hans Igler, Deutschkreutz, Burgenland. “An ideal combination of grape variety and terroir.’ says Falstaff Editor-in-Chief Peter Moser. 2. Leithaberg DAC Weingut Prieler, Schützen am Gebirge, Burgenland. I had a lovely lunch with Silvia Prieler from Weingut Prieler a few months ago in Burgenland. She is such a charming lady and the Prieler wines are just outstanding. I reported about my lunch here. Weingut Prieler was the Falstaff winemaker of the year in 2009. 3. 2008 Steinzeiler , Weingut Kollwentz, Großhöflein. This award is for wines that have spent more time aging before being released. Again, the two top wines are Blaufraenkisch wines. Picture: Christian G.E.Schiller with Christine and Franz Netzl in Washington DC. Picture: Christian G.E.Schiller with Alexander Skoff, Weingut Zahel in Vienna. Alexander Skoff, the nephew of Richard Zahel, is managing the cellar, the vineyards, customer support as well as the net activities of Weingut Zahel.